This weekend was a quiet one, and we needed it. Last week, I was out four of the five weeknights for lots of holiday cheer and that is too much for me and for the kids. Jeremy and I each had a work holiday party Thursday, along with Jack's holiday party at school Friday. Jack with the Day School's beloved "Grandma" Penny. By yesterday morning, I was pooped. Jack and I both were sick, and we all hid away from the world, spending Saturday in our pjs and watching the snow from our window. Jeremy and I even had to cancel our plans to attend friends' holiday party that night. Today, we regrouped. We were all feeling better and the sun was shining brightly. I took off early in the morning, hitting stores as they opened. I finished my Christmas shopping and bought my ingredients for my Hanukkah dinner (how many people can say that in the same sentence?). I came through our front door, stashing a few toy shopping bags in the front closet and triumphantly holding an 8-pound, bone-in turkey breast. I started dinner around 4 p.m. tonight. I have been determined to find the best shepherd's pie recipe ever. I have tried many a recipe and this time, I modified one I had found through the Epicurious app. While my version doesn't use the traditional ground lamb, I think I've found a winner. The fresh rosemary really makes this dish; one whiff of it, and I feel like I'm in Tommy Nevin's Pub back in Evanston. In a large sauté pan (I used my dutch oven) over medium-high heat, heat the oil, then add the onion, carrot, and meat. Cook until browned, 8 to 10 minutes. Drain the fat and add the broth, tomato paste, and herbs. Simmer until the juices thicken, about 10-12 minutes, then add the peas. Pour the mixture into a 9x13 baking dish and set aside. Meanwhile, bring the potatoes to a boil in salted water. Cook until tender, about 20 minutes; drain. Mash the potatoes with the butter, half-and-half, salt and pepper. My preferred mashing method is to bust out the electric hand mixer. Spread the mashed potatoes over the meat mixture, then crosshatch the top with a fork. Brush the potatoes with egg wash.
Bake in a 375-degree oven until golden, 30 to 35 minutes. Shepherd's pie is not the most photogenic. I tried to take pictures but they were not pretty. Just trust me on this one and try out this recipe some cold winter night. One of Jack's classmates hosted the loveliest holiday cookie party today after class. Parents held their children's hands as we crossed a sunny but chilly Michigan Avenue to our hosts' building. Sweet smells of buttercream icing and candy welcomed us. 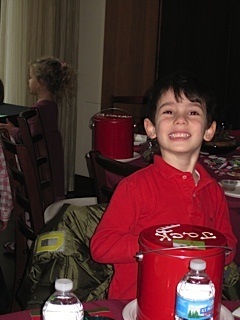 Our hosts had thought of every detail - each child had a red tin with his or her name on it, which Jack and his classmates decorated with holiday stickers. Lunch was served and then it was cookie time. Cookies lined the tables; small hands filled the tins. Undecorated cookies were set at the end of one table, with a tub of Sweet Mandy B's icing and sprinkles for decorating. Place the white chocolate chips in a 2-quart bowl. Microwave them for 1 minute, then stir with a wooden spoon. If the chips are not completely melted, microwave them for 30 seconds more, then stir until smooth. Let the chocolate cool and thicken slightly. One at a time, dip one end of a pretzel rod into the melted chocolate and use a plastic spoon or knife to spread the chocolate two-thirds of the way down the pretzel rod. Place the pretzel on a sheet of waxed paper and press on mini chocolate chips for eyes and buttons. Use orange decorators' gel to add a carrot nose. Chill the pretzels in the refrigerator until the chocolate hardens, about 2 minutes. 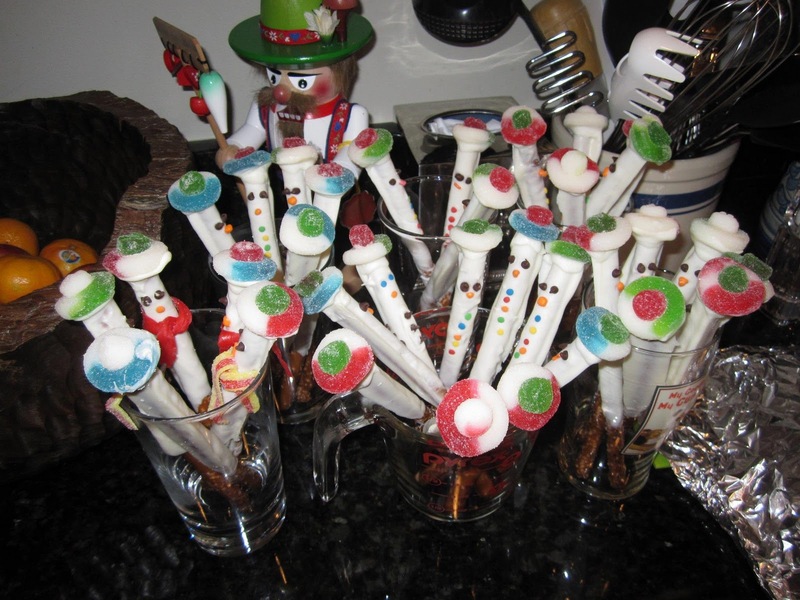 Stand the pretzels in a mug or glass and tie on strips of fruit leather for scarves. 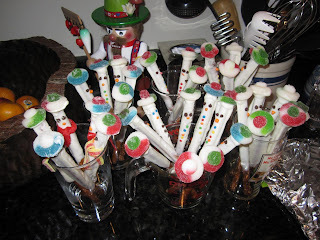 For each hat, stretch a gummy ring over the narrow end of a gumdrop and secure it to the pretzel rod with a dab of melted chocolate. Makes 10. Preheat oven to 400 degrees. Spray 2 large baking sheets with nonstick spray. Melt 1 cup chocolate chips in glass bowl in microwave, stirring twice, about 2 minutes. Using electric mixer, beat egg whites in large bowl to soft peaks. Gradually beat in 1 cup sugar. Continue beating until mixture resembles soft marshmallow creme. Whisk 1 cup sugar, cocoa, cornstarch, and salt in a medium bowl to blend. On low speed, beat dry ingredients into meringue. Stir in lukewarm chocolate and ½ cup chocolate chips (dough will become very stiff). Place ½ cup sugar in bowl. Roll 1 rounded tablespoon dough into ball; roll in sugar, coating thickly. Place on prepared sheet. Repeat with remaining dough, spacing 2 inches apart. Bake until puffed and tops crack, about 8 minutes. Cool on sheets for 10 minutes. Transfer to rack; cool. Makes about 24. This is an Italian wafer-like cookie that Jack and I brought. It requires a pizzelle press. Beat eggs and sugar. Add cooled melted butter and vanilla. Sift flour and baking powder and add to egg mixture. Batter will be stiff enough to be dropped by spoon. Batter can be refrigerated to be used as a later time. Bake using a pizzelle press, following the manufacturer's instructions. Makes 30 pizzelles. Shove dough into cookie press (wreath-shaped, of course). Sprinkle cookies with peppermint candies and bake per package instructions. Place in extremely overpriced cookie tin in hopes of fooling friends. Even the extremely overpriced cookie tin won't fool anyone but they won't call you on it either! We are very fortunate to have found Jack's preschool. It is such a warm community of teachers, parents and children. And today's activity could not have been more festive and full of childlike wonder. I would like to preface this post by saying I love Internet shopping. It is my saving grace this holiday season. Thank you, Amazon. This past Sunday morning, I was standing on Michigan Avenue and thought to myself, "What the heck am I doing here?" You could feel the rush of holiday shoppers descending on this shopping destination. I myself had just left church. Taking advantage of my validated parking at a nearby building (that's city living for you - validated parking to attend church), I had three errands to run: Return a pair of pants bought online; buy gloves for Jeremy at Bloomingdale's; and buy a box of thank you notes. I kept my head down and moved quickly. As most parents I know, Jeremy and I are trying to keep perspective on the holiday season, focusing on the joys of Christmas and spending more time with family and less time on the hustle and bustle of the season. Last night, we felt the joy. Jack and I made a mess of holiday cookies. Emphasis on the mess. There were sprinkles everywhere but we had the Frank Sinatra holiday station playing on Pandora; Jossie squealing at her toys as the Christmas lights sparkled; and the sweet smells of sugar cookies perfuming the air. Mix powdered sugar, butter, egg, vanilla and almond extracts. Stir in flour, baking soda and cream of tartar. Cover and refrigerate for at least 3 hours. Preheat oven to 375 degrees. Divide dough in half. Roll each half 3/16-inch thick on a lightly flour-covered surgace. Cut dough in desired shapes with cookie cutters. Bake on an ungreased cookie sheet for about 7 to 8 minutes (until edges are slightly browned). Frost and decorate as desired. Beat 1 cup powdered sugar, 1/2 t. vanilla extract and about 1 T. water or 1 to 2 T. of half and half until smooth and of spreading consistency. Tint with 2 to 3 drops of food coloring, if desired. Makes enough for 3 to 5 dozen cookies. This morning, I plugged in the Christmas tree lights and held Jack close as we enjoyed a quiet moment. I asked him what Christmas is about. "Being nice...," he replied and I felt my heart sing and a tear spring to my eye. "...to Santa, so I can get presents." Okay, so maybe there's a bit more work to be done. And mamas, my BFF turned me on to this website if you do need some quick, good ideas for Christmas gifts. All of these links are my own personal editorial - nothing was sponsored - just me spreading my finds.